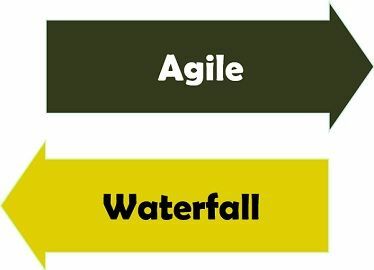 The Agile and Waterfall are the highly used SDLC (Software Development Life Cycle) models to develop software or web-based product. The process in an agile method involves iterations in which requirements are validated, designed and tested during the iterations. Conversely, in waterfall projects the requirements are fixed at the beginning then the other phases occur. With an agile method, the new requirements and changes can be implemented in the next iteration while this is not possible in the waterfall where the information and requirement gathering is done only once at a time. Objective Focuses on flexibility and adaptability. Concentrates on cost and scheduling control. No clear conception of the final product. Very clear idea about the final product. An agile method is a group of an iterative and incremental process, where each development process is treated differently and existing method need to be customized in order to best suit the project requirements. It provides a technique to evaluate the development and risk and also the direction in the whole development lifecycle. A series of rounds called iterations are used to create a product. Practically, each iteration takes up to 2-3 weeks for completing the job in which different teams are working, the tasks such as requirement gathering, requirement elicitation, planning, design, coding and testing. Individuals and interactions – In this step, the requirements are characterized at first, and assumed to be changing. Working software – The system is developed undergoing the short iterations where the analyzation, designing, coding, testing occurs in each iteration. Customer involvement – It includes the participation and approval of the customer during each iteration. The decisions made in this step must be correct in order to proceed in the next iteration. Quick adaptability – It should be capable of adapting the change swiftly as required for the proper and timely development of the software. This “inspect and adapt” method can greatly reduce the development expense and time. Documentation – At the end, the product is documented according to the project or often custom made. Waterfall model is considered as the fundamental software development life cycle model which is also linear and sequential. For moving forward in the next phase the current phase needs to be completed entirely. The growth of the waterfall model is analogous to the waterfall as the name suggests, where water flowing from the edge of the cliff to the downwards could never back to the cliff. Hence, the process is irrevertable; phases can never be assessed in the backward direction. The alternate name of the waterfall model is the classical life cycle model because it implements the systematic, sequential traditional approach for developing softwares. The phases of the waterfall model are explained below. Requirement analysis and specification phase – This phase consumes a lot of time and capital and can generate many errors. The major purpose of this phase is to understand, collect and document the requirements of the user. However, it involves a precise and concise requirement to eliminate any type of uncertainty and doubt. The document produced in this field is known as SRS(Software Requirement Specification) document. Design phase – The output generated in the previous phase serves as the input to the design phase where the product requirements are transformed into an appropriate structure. It uses a programming language which convenient and best suit the design and implementation of the product. The outcome generated in this field is known as the SDD (Software Design Description) document. Implementation and unit testing – In this phase, the emphasis is on the examination, correction and alteration of the code. If the previous stages have produced accurate and consistent results, this stage should go well. It involves the testing of one module at a time and generally a combination of system and integration testing which needs the reworking of the modules. If the integration job goes fine, there will be no signs of the severe bug issues remaining. Integration and system testing – It tests the system as a whole where the quality of the software product is tested. The costing of this phase is usually quite large. Operation and maintenance phase – This is the last phase which remains until the product is in use or operational. It arrives after releasing and installing the software into the machines. It also includes error correction, functional enhancement, and optimization of the software. Agile method emphasis on adaptability and flexibility. As against, in the waterfall technique, the control over cost and scheduling is more prior. Agile process steps are known as sprints while in the waterfall method the steps are known as the phases. Waterfall model does not allow the alteration and modification in the requirement specification. Conversely, in agile it is possible to add more requirements in the next sprint. One should have a precise and clear vision about the project while using a waterfall model. In contrast, agile does not mandate for having the clear idea about the final product. Waterfall model controls the changes in the project while agile implement the changes in the project. To develop a software any of the models can be used among waterfall and agile according to the requirements. However, both models hold equal importance against each other. Agile methodology is used when the small and frequent functionality or time to market is the priority. On the other hand, a waterfall model is useful where high-level business involvement is not required, but the quality is more important than speed.